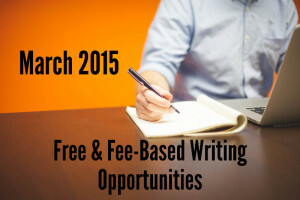 Are you looking for March 2015 free writing opportunities and contests as well as fee-based? Then this list will definitely be a helpful place to start. We’ve searched the web and come up with some great opportunities for March 2015 and a little further on down the line for those who like to plan ahead. We hope you can find one that is just right for you! These 2015 writing opportunities are divided into continuous opportunities and opportunities with a deadline. Opportunities with a deadline are (usually) listed in chronological order and further divided into free and fee-based opportunities to help make the list more readily accessible. Please understand that not every opportunity listed here is a contest, but due to the large size of the list and to make things easier for everyone to recognize as they go through the listings, we use the word “contest” to describe what is asked to either submit or to enter the contest. As always, please visit the site to be sure what you are submitting your work to. Thank you! If you have an opportunity you would like added to this list, please email us so that we can add it. Thank you! To submit: Send a genuinely poetic take on a current and specific news story or event. Contest: Flash fiction and short poems. Fiction only 200-700 words. Contest: Accept 3-5 poems or 1 short story (up to 5000 words) or 3 flash fiction (less than 100 words per piece). Contest: Accept only nonfiction. Writers may submit 3-5 or 1-3 essays (word total not to exceed 1500 words). Contest: Seeking works of fiction that are part of a greater book project. In most cases that means a novel excerpt, or a short story headed for a collection, but WIPs is open to any piece that fits the bill. Pieces should be 1500-7500 in length. Contest: Seeking any genre fiction up to 75 pages long. No non-fiction, memoirs, or children’s stories. Contest: Seeking flash nonfiction 250 words or less about beautiful things. Contest: Accepting unpublished deeply personal essays 1500-1700 words that deal with relationships, marriage, dating, and parenthood. Contest: Memoirs, biographical pieces, essays, poetry and interviews on literature, poetry, art/photography, the Beat Generation, rock/blues/folk/jazz, films and filmmakers, counterculture/1960s, writing and publishing advice, book collecting, and others. Contest: Accepting poetry, short fiction (100-4000 words), and essays (100-4000 words). Novel excerpts must be self-contained. Contest: Submit up to 5 poems of any length. Only one set of submissions at a time. Contest: Submit 1-3 poems at a time. Contest: Now accepting no more than 6 poems at a time for 2015 edition. Contest: This site takes a wide variety of pieces on a rolling basis. Accepting short short stories, manuscripts 2000-15000 words long, novellas, serialization of book-length works, poetry, one-act plays, audio, and more. Please see the website for complete details. Contest: Accepting memoir excerpts, personal essays, and flash creative nonfiction no more than 3500 words in length. Contest: Seeking poetry, art, cartoons, photography, illustrations, poetry, creative nonfiction, fiction, book reviews, and more. Contest: Accepting short fiction, nonfiction, and poetry. Maximum word count is 5000 words. Contest: Accepting essays and art on the set theme from both graduate and undergraduate students. Contest: Accepting short stories up to 25 pages double spaced, 1-3 poems, or personal essays/memoirs/interviews up to 25 pages double-spaced. Contest: Seeking fiction, nonfiction, and poetry for issue with no set theme. Contest: Currently seeking flash fiction (under 1,000 words) – 1 submission per reading period; short fiction (under 3,000 words) – 1 submission per reading period; creative nonfiction (under 3,000 words) – 1 submission per reading period; poetry – 1 submission of up to 3 poems per reading period. Prize: One copy of anthology and invitation to participate in signing at convention. Contest: Held by Bouchercon 2015; writers may submit a short story (3500-5500 words) by email. Contest: Accepting general fiction (up to 8000 words), nonfiction (up to 8000 words or 3 smaller pieces at no more than 1000 words each), poetry, and submissions for a special summer edition with the theme of FLIGHT. Contest: Submit 3-5 poems with no more than 50 lines per poem. Also accepting creative nonfiction and fiction (4000 word max). Flash fiction is encouraged. Contest: Accepting stories, essays, and travel stories (500-2500 words) and up to 10 photos per submission/story. Contest: We need stories, poems, essays, and color and black and white photography on all subjects, in any form. Length of stories: no more than 2500 words; poetry no more than 25 lines (only submit 3 poems at one time). Contest: Submissions are now being accepted for the 2015 Earth Day Poetry Contest. Poems must be about nature, with a 32-line limit each and up to two poems per submission. Previously published poems are acceptable. To enter, send submissions in the body of an email along with name, address, and titles of poems submitting. Contest: Open to fiction, nonfiction, and poetry. Fiction and nonfiction under 2000 words and poetry one page or less. Contest: Accepting fiction, nonfiction, poetry. See website for details. Contest: Writers may submit up to 3 unpublished poems. Contest: Accepting flash fiction (750 words or less), Fiction (up to 3000 words), nonfiction (up to 3000 words), nonfiction (up to 3000 words), poetry (up to 50 lines), and kids stories (under 2000 words). Contest: Seeking unpublished stories under 50 pages. No set theme. Special Requirements: Only accepting poems on the theme below. Special Requirements: Must be a living poet from America or Canada. Contest: Submit manuscript of poems 48-80 pages long. Contest: Submit one short story or 1-3 poems. Contest: Submit up to 3 short stories under 500 words long. Contest: Submit up to 3 poems no more than a total of 10 pages long. Contest: Submit one piece of nonfiction no more than 6000 words total. Contest: One essay or memoir pre entry. Contest: One story per entry. Contest: Up to 5 poems per entry. Contest: Submit up to 5 poems, one short story (up to 25 pages), or one essay (up to 25 pages). Contest: Accepting poetry, fiction, and nonfiction for upcoming anthology. Contest: Submit a poetry manuscript 50-120 pages long that is unpublished. Contest: Accepting manuscripts 100-300 pages in length of collected essays. Contest: Manuscripts are eligible for the First Book Poetry Competition if the author has not published or committed to publish a collection of his or her poetry in a book of 48 pages or more with a press run of at least 500 copies. Contest: Manuscripts are eligible for the Open Book Poetry Competition if the author has published at least one full-length collection of original poetry in English (of 48 pages or more with a press run of at least 500 copies). Contest: Accepting poetry, short fiction, and creative nonfiction for 3 separate awards. Contest: Accepting book-length collections of poetry written in English, regardless of publication history. Contest: Accepting fiction, poetry, and creative nonfiction. Contest: Submit previously unpublished words up to 7000 words long. Special Qualifications: Open to women who have not previously published a full-length book of poetry. Chapbooks do not disqualify. Contest: Submit up to 26 pages of poetry with author bio. Contest: Send all literary work (poems, short stories, one-act plays, interviews, book reviews, parts of memoirs, personal essays, critical essays, cultural news, announcements, and other new and emerging genres) with five copies to the editorial board. Bibliographies and documented articles should follow the MLA format. See website for postal address and additional information. Contest: Submit one poem of any length. Contest: South85 is accepting fiction, nonfiction, and poetry. See website for details as each has specific requirements. Prize: $1000, publication in Evansville Review and an invitation, with honorarium, to read as part of The Hyla Brook Reading Series at the Robert Frost Farm in Derry in the summer of 2015. Contest: Poems must be original, unpublished and metrical (any metrical form). No translations. There is no limit to the number of poems entered by an individual, but an entry fee of $5 U.S. per poem must accompany the submission. Contest: Submit 3-5 poems up to 30 lines per poem. Special Requirement: Must be an essay about weather. Contest: They are looking for creative essays on “weather”. Contest: Submit up to 3 short fiction pieces under 750 words. Can be flash fiction, memoir, or creative nonfiction. Contest: Accepting previously published prose (fiction/nonfiction) that the writer holds the rights to at this time. Contest: Short stories up to 4000 words long may be submitted on any subject. Contest: All themes accepted, limit 6000 words. Short stories, essays, or other works of prose. Contest: Accepting prose and poetry submissions. Contest: Submit manuscripts of 24-30 pages of poetry. Special Requirement: Science fiction, fantasy, horror, and speculative work only. Contest: Submit one fiction entry up to 5000 words or up to 3 poems (no more than 25 lines per piece). Special Requirements: Must be written in English and poet must reside in U.S. with les than two books of poetry published. Contest: Submit poetry manuscript 48-70 pages long. Special Requirements: Must be written in English and poet must reside in U.S. with less than 2 books published. Special Requirements: Must be written in English and poet must reside in U.S. Contest: Submit unpublished poetry manuscripts 48-100 pages long in 12 point font. Contest: Seeking unpublished poems. Writers may submit 2-5 poems via email. Details on webpage. Contest: Accepting fairy tale pieces. For prose, you may submit up to 8,000 words of a single piece or three, linked flash pieces each under 1,000 words in a single document. For poetry, you may submit up to 5 poems totaling no more than 10 pages. There is not specific theme. Accepting fiction, nonfiction, and drama. Contest: Submit via mail. Accepting fiction: short stories and novel excerpts in traditional and experimental styles (generally not exceeding 50 pages); poetry: poems in traditional and experimental styles but no light verse (up to 20 pages); drama: short plays in traditional and experimental styles (generally not exceeding 50 pages); and prose: literary nonfiction in traditional and experimental styles (generally not exceeding 50 pages). Contest: Seeking creative nonfiction, including narrative reportage, essays, and memoirs, as well as critical essays that examine the emerging genre and that explore the impact of nonfiction narrative on the lives of its writers, subjects, and readers. Contest: Short stories 3000-8000 words long on any subject in any style. Special Requirements: No previously published work. Contest: Please visit the website for very clear, detailed requirements for submissions. This venue accepts Art and Photo Essays. Fiction, Poetry, Non-fiction, Recipes, Photo Essays, Book Reviews, Art, and Music. Contest: Seeking fiction and nonfiction (3-25 pages), poetry, graphic narratives, book reviews, and visual arts. See website for details. Contest: Accepting fiction, nonfiction, poetry, photography, and graphic design. Theme is the writer as artist, but pieces are not limited to that theme. Contest: Looking for a full-length poetry collection at least 48 pages long. Contest: Submit up to 4 poems per entry, 8 pages maximum. Prize: $300, 20 author copies of print book, 1930s depression glass trophy and published book as print and e-book. Contest: Submit 17-24 pages of poetry not including title page, Table of Contents, and end notes). NOTICE: We are not affiliated with these writing opportunities or the websites that sponsor them. We can therefore not assure you as to whether or not they are reliable and trustworthy. While we have made every effort to visit the websites listed on this page, checked links, and read briefly into the events, there is no way for us to know whether every opportunity is the right one for you. Please visit the websites and read all information regarding the event before you make the decision as to whether or not the opportunity is one you are interested in pursuing.